string(38) "Libera, My Love! - Libera, amore mio! " Title: Libera, My Love! - Libera, amore mio! 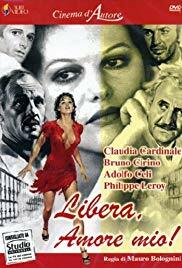 Plot: The story of the aptly named Libera Amore Anarchia, an indominable anti-fascist and inspirational Italian anarchist mother of two — Carlo and Anna — played by Claudia Cardinale in what was, probably, one of her finest roles. ‘Libera, amore mio!’ encompasses the twenty years or so of the rise and transition of Italian fascism — from the mid-1920s to April 1945 — to Christian Democracy through the eyes of Libera, daughter of her equally refractory anarchist father, Felice Valente, played by the marvellous Adolfo Celli. (Anyone remember him as Rodrigo Borgia in the 1981 TV mini-series The Borgias?) Uncowed by fascist brutality, Libera, consistently flaunts her opposition to Mussolini’s regime by wearing a scarlet dress, a direct provocation to the blackshirt ‘squadristi’, and incessantly and fearlessly voicing her opposition to the regime’s injustices, propaganda and bully-boys. This irrepressible behaviour has, of course, consequences for her and her family who — like her dad, imprisoned in Ustica — face constant harassment, exile from Rome to Livorno and Modena, imprisonment in Padua, and her and her son Carlo’s involvement with the Resistance. The story provides director Bolognini the ideal opportunity to explore the movingly rock-solid and loving relationship between Libera and her long-suffering husband Bruno Cirino, played by Matteo Zanoni, who despite his obvious ‘Jings, crivvens and help-ma-boab’ irritation, supports her unhesitatingly. As in post-Franco Spain, as Libera discovers to her cost, in Italy, the institutions of state were never purged of fascists, simply absorbed into the Truman-sponsored anti-leftist Democrazia Cristiana. After the Liberation she discovers — in a powerful scene — to her horror that her former fascist nemesis, political commissioner Franco Testa, played by Phillippe Leroy, has been appointed head of the municipal housing department. NB Luciano Vincenzoni’s script was inspired by the real life experiences and example of his mother.